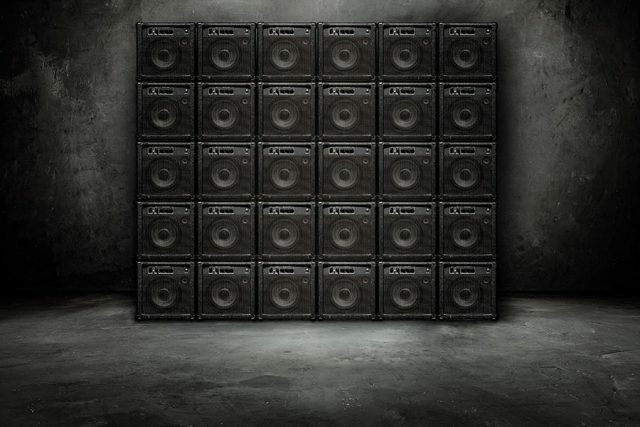 Recently I needed a wall of speakers in my studio to make an amazing background for an upcoming music shoot. But after a bit of thought I realised there were three major problems with the idea. First, my studio space is a lot smaller then my imagination. Second, I don’t have easy access to the 25 – 30 speakers I would need for a person sized wall and third, what would I do with all those speakers after the shoot? However I do own one small PA amp (I use it during my camera club talks) and of course I have Photoshop. So here it is, a wall of sound in my studio and all it took was a couple of photos plus an hour or two in Photoshop. The only thing missing is a musician but I’ll get to that in a later post. In the meantime, I’m sharing this background as a Friday Freebie. The images are copyright Gavin Hoey 2018. Use is limited to any personal but non-commercial purposes. Please share the Friday Freebie by linking back to this page. Do not redistribute the original images without my permission. That Wall of Sound looks really good. Your idea has given me food for thought about a shoot I will be doing in the future.. Thanks Gavin. I enjoy photographing live bands on stage but one of the problems is that the backgrounds leave a lot to be desired so this was perfect. It’s a bit experimental on my part since I have next to no experience of creating composites. You might recognize the smoke textures as well (lol). Sorry, I forgot to say “thank you”. Gavin, your practical style to get amazing results never ceases to amaze me. Thank you for all your hard work.